Don’t look now, but graduation is coming and mid-may will be here soon. The hats will fly and so will the scholar in your life, off to a fresh start, in a big world filled with possibilities. Here at Executive Essentials we know that a graduation gift is more than just a memento of a job well done. It’s an opportunity to commemorate an important moment in a graduate’s life and giving the gift of a fine writing instrument is a hugely popular choice. We also know that there are literally thousands of pens from a multitude of manufacturers to choose from and picking the right pen, with the right personality to fit your graduate can be difficult. That is why over the next few weeks building up to graduation we are going to do a series on the types and styles of pens that exist to help you get a better idea of what pen is the right gift to give. We will talk a little about fountain pens, rollerball pens, ballpoint pens, pencils and multi-function pens. We’ll also talk about the brands that exist and let you in on a bit of the history to help you better understand the quality and versatility each has to offer. And, of course, we will talk about price, offering up examples that are exquisite pieces of art (with prices to match) as well as offerings from the mid-to-lower end of the spectrum that are as beautiful as they are durable and fun. All of this, plus a healthy dose of staff favorites that can’t be beat. The key to choosing the right pen for your graduation gift is to find one that has the right personality to fit your graduate. It may sound a bit dramatic to talk about pen personalities, but I think that once you begin to look around at the various styles and learn the history of the pens, you’ll begin to understand why we talk about them this way. You’ll find that some pens are royalty, a bit stuffy, but majestic. Others are carefree and embody a youthful spirit. Some look to the future, while others turn to the past. Some are scientific, without being nerdy, while others are nerdy without being geeky. Sleek and smooth or fat and bumpy, all kinds exist. So take a look around, but come back soon and we’ll guide you through the world of pens that is Executive Essentials. And as always, don’t be afraid to leave a comment with a question. We love to help. Graduation is coming soon and that means finding the perfect gift for that scholar in our lives. Because fine writing instruments are a perennial favorite among graduation gift ideas we decided to write a short blog series outlining the types and styles of pens available. There are hundreds of pens to choose from with a wide range of price. We hope that this short series gives you a better understanding of the offerings that exist. Today we are going to talk a little bit about qualities and attributes of the ball point, rollerball and fountain pen. Point of fact: According to the Writing Instrument Manufacturers Association, most ball point pens have the ability to draw a line 4,000 to 7,500 feet in length. Whether or not the line is straight is, of course, up to you. The earliest this little-known fact could have been tested was in 1888 when the first known patent for a ball point pen was issued to John Loud. Mr. Loud devised the pen as a means to write on the leather goods that he created as a tanner. Although the use would eventually spread from tanned leather to paper-like products, the original pens were much too rough for use on materials less durable than cured hide. Today disposable ball point pens are found in every nook and cranny of our world. They are so cheap to produce that many organizations give them away free as advertising—with logos emblazoned on the side. It’s easy to consider the ball point as only a disposable item, but this is far from the truth. Many people prefer a quality ball point pen over any other type of pen because of their ease of use and design. Ballpoint pens use an oil-based ink and a tight ballpoint that requires more pressure than other pen types. The oil-based ink lays down a nice tight line the size of the pen tip and resists bleeding. The tight ballpoint at the tip prevents the pen from leaking, making it a perfect candidate for the purse or pocket. Unfortunately, the oil-based ink in conjunction with the pen tip makes the pen unsuitable for all surfaces. The ball point pen dominated the writing instrument market with little variation until 89 years after John Loud received his patent. It was 1977 that saw the invention of the rollerball pen. The concept behind the rollerball was to create a hybrid of the ball point and the fountain pen by introducing a water-based or gel-based ink. This gave the pen an ease of use associated with ball point pens as well as a nice wet, penetrating stroke like a fountain pen. Rollerball pens have a number of unique characteristics that make them popular among pen enthusiasts. Because rollerball pens use a thicker ink the ball at the tip of the pen does not need to be sealed as tightly. This allows the user to exert less pressure when writing. The thickness and ‘wetness’ of the ink produces a more consistent stroke with less dry skips that sometimes appear with a ball point pen. Gel based inks also come in a wide variety of color, in contrast to their oil-based counterparts. The actual origin of the fountain pen on the world stage is a little hazy. This is because a pen designed with an ink reservoir has been documented as early as the 10th century. It is because fountain pens have such a long, rich history in nearly every nation of the world that so many people are drawn to them, but at the same time shy away from using one themselves. Many people feel that a fountain pen requires a great deal of effort to learn to use, that they are hard to take care of and that they are fragile. The fact is that modern fountain pens are extremely user-friendly, easy to take care of and more durable than earlier iterations. Modern fountain pens are the product of science and art. The old problem of spilled ink and leaking pens has been solved with pre-filled cartridges, although it is still possible to purchase fountain pens you fill manually. The design of the nibs – the tip of the pen that transfers the ink to the paper — now come in a variety and quality that accommodate all writing styles. Advances made in the construction of modern fountain pens have made them as durable as they are beautiful. The greatest advancement in the fountain pen, however, is the price. No longer is the fountain pen a writing instrument for the wealthy and royal. Affordable fountain pens exist erasing the only real reason not to try one out –or to give one as a gift. That is our quick trip through the types of pens you can expect to see at Executive Essentials. All three have their own unique style and history and all three have their own character. Take the time to browse through our online catalog to get a sense of what is available. Next post we will talk a little about a few of the companies out there that are producing high-quality pens that are fun, inventive and unique. Until then, feel free to leave a comment and ask a question. We’d love to hear from you. Today we are taking a short break from our series on how to find the perfect pen to give as a graduation gift in order to gather information — from you! We know from years past that many people love to give fine pens as gifts, but are often overwhelmed by the sheer volume of pen types and styles that exist. This is because Executive Essentials carries 44 brands of pens. When you consider that many brands have more than one style-line and dozens of pens in each line, well, it can make it hard for those new to the world of pens to know what to look for. In fact, when I began to think about how to talk about pen brands for this guide I quickly realized that I wouldn’t be able to go into any kind of depth on all 44 brands. I was going to have to pick and choose. But how? Then it dawned on me. Not only could I do research on some of my favorite brands and report back, but I could ask the thousands of pen collectors and aficionados from around the World (Wide Web) what their favorite pen brands and styles are. Then Executive Essentials could bring this information back to the blog. This would offer a wide array of opinions and experience and be a great help to all those who are new to the world of pens. So here is how it works. If you have a particular pen brand or style that you just love and think it would make the perfect graduation gift, leave a comment below or contact me at missoulakid@gmail.com. Leave as much information as you want. Some folks might just want to name a brand or a specific pen. You might want to leave a detailed description of why you love the pen, how you first came to know about it and a little about your collection. If you’re one of the many hundreds of pen collectors that write their own blog, Executive Essentials would be interested in offering up a guest blog spot so you can share your knowledge. The key here is to have fun and be informative. Leave as much information as you want. Some folks might just want to name a brand or a specific pen. You might want to leave a detailed description of why you love the pen, how you first came to know about it and a little about your collection. If you’re one of the many hundreds of pen collectors that write their own blog, Executive Essentials would be interested in offering up a guest blog spot so you can share your knowledge. The key here is to have fun and be informative. But what if your not a pen collector? We still want to hear from you. If you are interested in learning more about a brand of pen or specific pen, leave a comment with your question and we will consider it for it’s own blog post. We’ll do our best to shed light on the questions you have and at the same time provide useful information to others. I’m really excited to engage with the professional pen community and the casual collector on this project and hopefully others. The Executive Essentials pen blog was always envisioned as a place for collectors, buyers and sellers to come together to share knowledge, opinions, and experience. And 2011 is shaping up to be the year this happens. So if you have something to contribute, take a short moment and let us hear from you. Did I mention I was excited! Author ReneePosted on August 1, 2017 August 1, 2017 Categories Gifts, PensTags Favorite Pens, Gift Ideas, Gifts, Graduation, Pens, WatermanLeave a comment on Executive Essentials Needs You! Science is everywhere and yet a vast majority of folks tend to shy away from spending a great deal of time learning much about the laws of physics, the theory of relativity or the Copenhagen Interpretation. Not that I can blame them. The most science-y activity I’ve researched in the last few years was how to brew beer and really most of that came down to taste-testing. With that in mind though, we should really take the time to thank a graduate of a science program this year for taking on the task of learning all the minutia of how our universe works in order to make our world a more efficient effective and better place. And, a nice pen that speaks to their better qualities is a good start. There are some really great pens on the Executive Essentials site that represent science in either name, look, feel or all of the above. Take a look at these five that I’ve selected for starters. The writing tools of Acme Studios are created to commemorate the artistic achievements of the 20th century’s greatest contemporary artists, architects, and designers. This Acme Science Rollerball is made up of a high gloss peach colored resin decorated with Da Vinci’s Vitruvian Man. Not only was Da Vinci a great artist, but he was a great scientist-observer who created ideas for musical instruments, hydraulic pumps, reversible crank mechanisms, finned mortar shells, and even a steam cannon. This pen is great for that experimenter scientist. Space, they say, is the final frontier. With the shuttering of manned space flights into the foreseeable future, it’s important that we encourage the youth of today to keep looking up to the stars so that we can continue to learn more about the universe we live in. What’s more, many inventions that we use today stemmed from research coming from NASA scientists. I know that the Starwalker has nothing to do with space itself, but the name invokes the image of a person who’s an inquisitive, dreamer with a yearning to break boundaries. To me, argyle most succinctly defines the history of the scientific profession in terms of fashion even more than a white lab coat. The sweet natured, sweater-vested scientist, festooned in argyle with unkempt hair is the go to the stereotype of cinema and TV. But, perhaps that’s just because I grew up in the 80’s? Regardless, this Think Alla Moda rollerball pen has a unique style with flamboyant color combinations which really make this pen the perfect writing tool for those that have a scientist’s eye for fashion. You know that when you are forced to hit up Wikipedia for the meaning behind a pens name that you’ve probably stumbled across some science. That was the case with the Krone Resonance. Krone is the name of the pen company that started in 1997 when it issued the unique and controversial Abraham Lincoln Limited Edition pen. What made this pen so unique was that it was embedded with the Civil War President’s DNA. Yes, his DNA. In addition, the term resonance is the tendency of a system to oscillate with larger amplitude at some frequencies than at others. A great looking pen just waiting to help a young scientist release some of their potential energy. I’ll be honest with you, I just happen to stumble across this pen and immediately loved it. It really has nothing to do with science at all. I mean, sure, I could talk about the shape of the feather and how it’s been used to help humankind create a myriad of inventions that have made life easier since we began to understand how they worked. But I’m not going to do that. Because what really struck me as science about it, was its futuristic appeal. Which of course brings to mind my favorite kind of science – science fiction. Science fiction represents the best part of science. The dreamy part of science that makes our minds wander into thoughts of teleportation, faster than light travel, jet packs and healthy fast food. 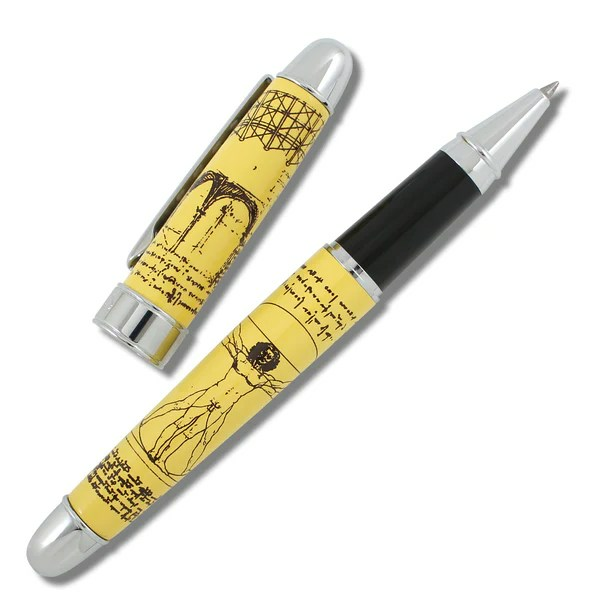 This pen is perfect for that visionary scientist in your life. These are just a few of the many pens that Executive Essentials has in their store. There are much more for you to view. So take a look around and please, if you have any questions or need some information about a pen, just ask. We are happy to help. The graduation countdown continues at a fast pace as students work hard to finish their last papers and tests, all-the-while navigating the finalizing paperwork that comes with commencement. If you’ve been following us over the last few weeks you know that we have been slowly working our way through a fun and informational 2011 graduation gift guide. We know from years past that pens are a popular graduation gift. The problem that we’ve noticed is that people become overwhelmed with the quantity of pen styles that are available. We’ve already talked about the three basic pen types: the rollerball, the ballpoint and the fountain pen and we’ve already touched on what types of pens we think would be great for that science major in your life. So today, we are going to talk a little bit about history. Specifically, what types of pens a history graduate would appreciate. To scholars with an emphasis in American history, there is no greater historic moment than the signing of the Declaration of Independence in 1776. Here, Visconti uses their sophisticated scrimshaw technique to replicate the full text of the Declaration of Independence into the barrel of the pen. The writing is small, just large enough to be legible to the naked eye but still small enough to leave room to inscribe the Founding Fathers who drafted the act. A specially engraved magnifying glass is included with each pen to pay closer attention to the intricate details. The Middle East’s constant struggle to resolve its myriad number of conflicts often overshadows the rich history of this diverse region. Many contemporary history students have turned their eyes to the Middle East, working hard to peel back the layers of complex systems and structures to understand the lessons that lay underneath. One piece of that Middle East history is embodied in the “Israel 60 Year Limited Edition Rollerball Pen” from Delta Pens which commemorates 60 years of Israel’s independence. The marbled blue body of this pen also contains a clip made of solid sterling silver reproducing the Yad. A Yad, literally “hand”, is a Jewish ritual pointer, used to point to the text during the Torah reading. It is intended to prevent anyone from touching the parchment, which is considered sacred. Many historians will comment that one of the values of studying history is so that we do not repeat history – at least the portions of history not worth repeating. This couldn’t be truer than in the category of politics and war. Although a pessimistic view might call-out that politics and war are merely two sides of the same coin, a true historian will ferret out the functions of both and realize the advantages as they’ve been revealed over the ages. For those graduates of history, the Conway Stewart Wellington Rollerball is a perfect gift. This classic, substantial pen is a tribute to the Duke of Wellington who is widely considered one of the leading military and political figures of the first half of the 19th century and an all around prominent figure in the history of England. He achieved many heights throughout his political career: an Anglo-Irish general and statesman, chief secretary for Ireland, ambassador to France, commander in chief of the British army, victor at the Battle of Waterloo, twice British prime minister and were one of the leading figures in the House of Lords. Sometimes we need to be reminded that history isn’t all about conflict, strife, and change. It’s not all about oversized textbooks filled with dusty facts and studied speculation. If you need convincing, just ask an art historian or the soon to be art history graduate. They will tell you that history is about observation and reflection, specifically on the works of man from the beginning of time, in all forms. A great, inexpensive pen that captures the essence of the art history graduate is The Metropolitan Museum of Art, Color Magic Rollerball Pen. This inventive pen reminds us that in the hands of an artist, it takes only a few colors to mix almost every conceivable shade. This pen has a translucent outer lens that spins around the cap like a carousel. Like magic, the colors of the lens mix and transform the colors underneath, creating the hues of the rainbow in the palm of your hand. I understand that by placing double emphasis on American history I run the risk of alienating those who chose to study some other historical topic, like women’s history, labor history, music history or any of the other various history topics. But, since this is a list of my 5 favorite pens for graduating history majors – I’m doing it. On April 30, 1789, George Washington stood on the balcony of the Federal Hall on Wall Street in New York and took the oath of office as the first President of the United States. President Washington set the standards for all who followed by his wise and honorable leadership and unwavering devotion to the American people and the principles of the Constitution. Krone Pens honor George Washington, the father of our country, with an elegantly handcrafted writing instrument. Hand painted in rich presidential navy, the cap is adorned with ornate gold detailing featuring the Washington family coat of arms. The matte silver clip’s raised nail heads are reminiscent of the colonial era. Fine barley etching details both ends of the cap and barrel, as well as the nib casing. George Washington’s signature is engraved at the base of the cap. Hand painted to capture the victorious winter’s day, the barrel depicts General Washington gallantly leading the Americans at the Battle of Princeton. A coin atop the pen encapsulates fibers taken from Washington’s uniform decorated with ‘The Society of the Cincinnati’ emblem. ‘The Society of the Cincinnati’ originally a brotherhood of war veterans continues today as an organization dedicated to public interest in the American Revolution. That ends this installment of pens for the History Graduate. For more ideas please check out the Executive Essentials online pen catalog. And as always, please feel free to comment or leave a question for us. We would be happy to help. College Graduation Gift Ideas : For Him, For Her. If you’re looking for gift ideas for your soon to be graduated college student then let me be the first to tell you that you have come to the right place. Over the last few weeks, Executive Essentials has gathered some of our favorite pens and talked a little about the unique qualities they contain. We know from years of experience that pens make the best graduation gifts, not only for college graduates but high school graduates as well. And we will present more pens targeted towards specific majors over the next few weeks. But today I wanted to stray a little outside the pen-box and talk about some unique graduation gifts that Executive Essentials carries. For those who are new to the world of Executive Essentials (EE), you may not know that we are more than just pen store in Mount Prospect, Illinois. EE carries all sorts of gifts and products that make life enjoyable, easier and stylish. In fact, we have many varieties of luggage, desktop accessories, laptop and tote bags, briefcases, wallets, and purses. An entire selection of fine goods made for the fast paced world of business. With that in mind, I thought it might be a good idea to take a look at some of the non-pen products that freshly graduated students might find useful and fun in their new jobs. Acme is a company that loves fun and style and they are experts at bringing this style into the business world without making it goofy and childlike. There are a number of great business card cases made by Acme for both men and women, but this Blueprint Business Card Case is one of my favorites. Paying homage to the profession that Frank Loyd Wright made famous, this sleek, sturdy case is perfect for that young professional in their new career. Bey Berk is one of my new favorite companies. I hadn’t heard of Bey Berk before coming to work at EE, but the more products from them I see, the more I understand how committed they are to quality and design. I was first introduced to them through their great pen boxes and cases. 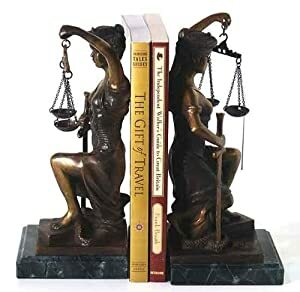 These amazing Lady Justice Bookends and just the thing to hold that newly minted lawyer’s law library in place. These bookends are cast in solid bronze and set upon solid marble, measuring nearly 9 inches tall. We all know that having a degree to practice medicine is mandatory, but it’s not nearly as important as having completely illegible handwriting. Well, that doctor new to the world might have messing handwriting, but that doesn’t mean he needs to have an unkempt subscription pad. This Horizontal Prescription Pad from Hartmann Briefcases is just the thing to help him keep track of his daily doses. And you might consider a nice pen to go along with it. Over the last handful of years that graduate in your life has been lugging around the same messenger bag from class to class. It’s got coffee stains on the bottom, a ripped lanyard with a broken clip, pretzel crumbs mashed into the pencil pockets and some sort of unidentified stain on the back — donut glaze perhaps? Sure, the strap still works, but only because they repaired it with a carabiner. All it’s filled with fond memories (and other unmentionable items) the ratty, old messenger bag just can’t accompany your graduate into the business world. Instead, they need a great briefcase like the one from Travelpro. This amazing bag is made out of ballistic nylon fabric. It has a pocket for your 17-inch laptop, water bottle and is large enough for legal papers. It has locking zippers and is sized to be checkpoint friendly at the airport. Bonus days! Being organized in the real world takes more than persistence and determination. It takes a good system and the right tools. Not only will this amazing Hobo International Vintage Leather Clutch be a great place to keep your business cards, but its tri-fold frame design has eight credit card slots, an ID window, three bill pockets, a zip security pocket and a detachable cosmetic mirror. It’s basically a graduates best friend wrapped in cowhide and fringed with antique hardware. We can argue about this all we want –and people do — but in a handful of years, the Ipad (and the windows version of it when it comes out) will be the replacement for a laptop. The iPad, in general, can make any professionals life much easier on a day to day basis. Not only does it allow you to keep in constant contact with your clients, friends, and family, but the apps available on the Ipad range from insanely fun to hard-to-live-without-once-you’ve-used-it. Once you have something that important in your life (and expensive) you want to protect it. This Dilana Leather Ipad Easel is just the item to keep it safe and make it easier to use. I mentioned a great briefcase for the men, so I thought I would pull one out of the catalog for the women. There are so many to choose from here at Executive Essentials that it was hard to choose. But I did finally find this Winn Slim Ladies Briefcase. This great bag has a computer sleeve built in that is good for laptops (and Ipads) up to 15 inches. It comes with a makeup pouch in matching leather, metal feet to protect the bottom of the bag, an adjustable shoulder strap, a full-length zipper and a file folder pocket. She’ll be organized and stylish. These are just a few of the many great graduation gift ideas available here at EE. The catalog is literally bursting with items to suit any taste and need. So take the time to look around and see if anything fits the character and needs of your soon-to-be-graduate. Author ReneePosted on August 1, 2017 Categories Gifts, Gifts for Dads & Grads, Laptops & Briefcases, Wallets & AccessoriesTags Acme, Bey-Berk, Bookends, Briefcases, Business Card Case, Clutches, Gifts, Gifts for Grads, Graduate Gift Guide, Graduation, Graduation Gifts, Hartmann, Hobo, Leather, Leather Goods, TravelPro, Winn InternationalLeave a comment on College Graduation Gift Ideas : For Him, For Her.